I was having a “what to have for lunch” moment the other day. I’ve been having salads for lunch lately. A lot of salads. And while I love them for a variety of reasons, it was time for a change. A salad wasn’t going to work for me, hence the “what to have for lunch” moment. Now what to put in it…I opened the produce drawers and discovered that I still had the cucumber and tomato that I’d bought the week before to make a Quinoa Taboulleh (which I still had not made. Obviously.) And while they were not in bad shape, they certainly needed to be eaten. Soon. So cucumbers and tomatoes it is. And as I looked up into the rest of the fridge, my eyes fell on the ranch dressing that I mixed up with testing and fine tuning the homemade ranch dressing mix. It was then that a little light from heaven shone down…right into my fridge. And my heart and belly leapt with joy! Pasta with Cucumbers, Tomatoes and Ranch…maybe a little shredded cheese. As we move into “Pasta Salad Season,” I urge you to try a pasta salad with ranch dressing. It’s a lovely, lovely thing. Toss in whatever goodies you like…cukes, tomatoes, boiled egg, ham, turkey, bacon, onions, it doesn’t matter…just “Toss It In”! What’s your favorite kind of pasta salad?!? Will you be trying any new pasta salads this summer?! Cook the pasta as directed on the box. Drain and add to serving bowl. Toss the ranch dressing in with the pasta. Then toss in the diced tomatoes, diced cucumber (peeled if you prefer), chopped turkey and shredded cheese. I love toss it in dishes. They are always an interesting mix of flavors. I just made the same thing – “Toss It In” Pasta Salad yesterday. I like to make a lot of it because my husband eats it like candy. LOVE salads like this! Can’t wait to try that homemade ranch! I typed my recipe wrong, it was supposed to be Buffalo CHICKPEA patties. Guess my fingers were going too fast! Some of my best recipes come from days like this. This sounds great and typically stuff I might have around (or something similar). It’s a simple, light, and refreshing summer go-to dish! That’s a great idea! I always have a few leftover veggies hanging around! My favorite is with spiral rotini pasta, pepperoni bits, cubed white cheddar, chopped olives, and green pepper. Mix with a caesar Italian dressing to taste. Delicious! This was our dinner Sunday night and my lunch yesterday. We had some leftover BBQ chicken. I added hard boiled egg, carrots, cheese, pickles, red onion, garbanzo beans, peas, a bit of mayo, and black pepper. It’s delish! In the summer I add diced cooked chicken, chopped celery and madarin oranges to cooked and drained pasta. We like Miracle Whip (light) mixed in. YUM! 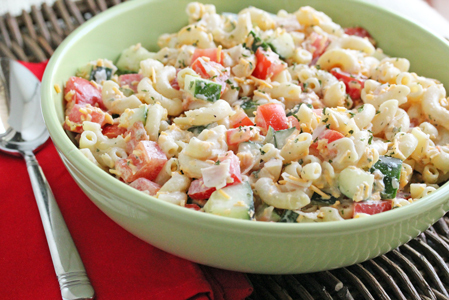 This is my favorite pasta salad: http://allrecipes.com/Recipe/Moms-Best-Macaroni-Salad/Detail.aspx. Actually that is probably my 2nd favorite. Our old neighbors make the best pasta salad but they claim to not have an actual recipe, just dump a bunch of ingredients in without measuring. I can’t seem to duplicate it so I think they are holding out on me :). I love meals like this, we make a lot of pasta salad in the summers. Our favorites so far are pasta salads with tomatos, pepperoni, cucumbers, diced red onions, cubed cheddar cheese, italian salad dressing and suddenly salad (found in the spices area of the grocery store), or Chicken Bacon Ranch pasta salad- cooked, cubed chicken (I always use leftovers), diced bacon, ranch dressing, chopped tomatoes,cucumber and topped with a bit of cheddar cheese if you want. I do have some new recipes I can’t wait to try, chipotle chicken pasta salad is on the top of my list! I can’t wait to try this using frozen pasta, that I make in bulk and freeze for quick meals like this one. And I’m going to try the homemade dressing, too. I called it Cobb Pasta Salad and it was YUMMY! I need a little help making a little recipe book for christmas at the ICAP office in Kingsbury county in South Dakota .